As well as news of The Telegraph's involvement, the longlist for the Autobiography of the Year Award has been released. David Willis, chairman of The Telegraph Sports Book Awards said: "We are firstly delighted to welcome The Telegraph as our title sponsor for 2019 in what will be another great year for sport. Our 2019 longlist is once again packed with sporting greats and legendary sports stars from the UK. 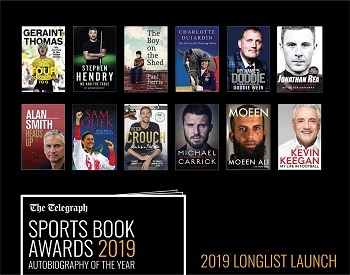 Any of these fantastic new books would make perfect Christmas gifts and I don’t envy the task of the judging panel to select the best sports Autobiography of the Year." The Telegraph Sports Book Awards are judged by sports celebrities, broadcasters and journalists. The judging panels for 2019 include: Dame Katherine Grainger, Christine Ohuruogu, Simon Halliday, Bob Willis, Sir Tim Rice, The Rugby Writers, David Millar, Jill Douglas, Simon Brotherton, Andrew Cotter, Jacuqie Beltrao, Clare Tomlinson, The Football Writers and Rishi Persad.